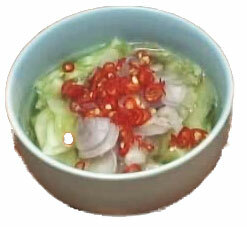 Cucumber and Chilli Dipping Sauce (Nam Jime Arjad) is a piquant, sweet, spicy and very refreshing watery sauce mostly used to accompany Chicken or Pork Satay, but if you like it as I do, add it to other dishes too. You can make another version of this sauce good for fishy dishes. Simply remove the cucumber and shallots and one chilli. The remaining chilli should be gently pounded 3-4 times only. The rest is the same!